Odour is obnoxious smell that offends human olfactory organs. Normally gases like Hydrogen Sulphide, Indole, Skatole, Mercaptans, Methyl Amine etc. emits typical sewage odours. The threshold value for H2S is considered to be in the range of 0.05 – 12 ppmv, which is why even very small quantity is noticeable. The odour control or air treatment is done by passing the polluted air through the bed of specially designed Activated carbon. The air in the sewage lift station is sucked by an induced draft Fan into Carbon Filter, where the sucked air is passed through carbon bed. The carbon bed adsorbs the various gases like Hydrogen Sulphide, Indole, Skatole, Mercaptans, Methyl Amine etc. on to the surface of the carbon. The Activated carbon is specially engineered to have mesoporous as well as macroporous nature to have maximum area available for Chemisorption of odour producing gases. Instrumentation such as H2S meter & pressure gauges etc. blowers and impellers, especially when the blower is put before the activated carbon bed. Odour control activated carbon beds typically run in up-flow mode at a few inches of water column pressure. Oxygen is required for effective performance (more than 4 times the H2S concentration on a molar basis is normally sufficient). A minimum relative humidity of 30% (preferably higher) is recommended. Carbon loaded with hydrogen sulphide and mercaptans is not considered a hazardous material for the purpose of handling and disposal. 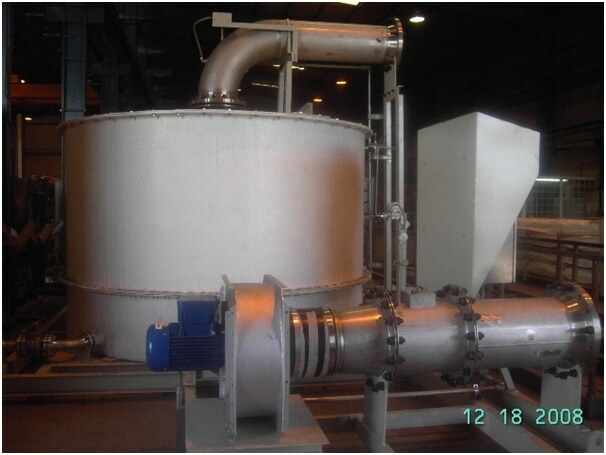 Typical odour treatment equipment is displayed in picture.